Recent review: Marc was great and we have a wonderful time. We look forward to more trivia at local bars. It goes in your coffee. It’s white. Um... paper, snow, a ghost! Whether Pyramid is your game or you prefer The Price is Right, Family Feud, or Jeopardy, we are sure at some point you've found yourself yelling answers at the TV swearing you could do so much better than the contestants. Well now is your chance to get in the game! 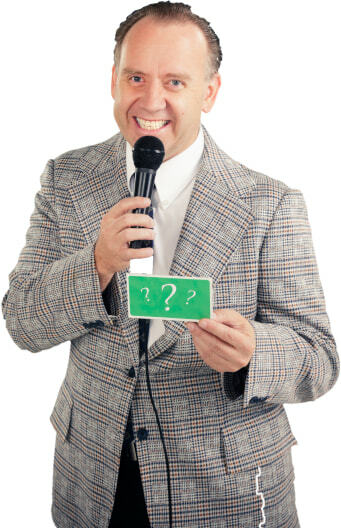 Hire a Game Show to come and infuse your next event with some fun competition. Game shows can be a fun choice for families, friends, co-workers, or even strangers at a public event. Game on! Search for Game Shows in Holyoke, Massachusetts above. Please note that these Game Shows may also travel to Southampton, Granby, Indian Orchard, Montgomery, Feeding Hills, Florence, Wilbraham, Woronoco, East Longmeadow, Leeds, Hadley, Russell, West Hatfield, Belchertown, Hatfield, Southwick, Haydenville, Huntington, Three Rivers, Hampden, West Suffield, Bondsville, North Hatfield, Bradstreet, Suffield, Thorndike, Enfield, North Amherst, Palmer, and Blandford.